When you leave a comment on THIS post by 6 p.m. CT Sunday, June 16, 2013 you'll be entered in the DRAWING for a copy of the book mentioned below. If you mention in your comment that you’re a follower (see in the left column “Join This Site” and “Follow by Email”), I’ll add your name a second time in the drawing. You must be eighteen, have a U.S. mailing address, void where prohibited. You can read details about my book giveaways at Disclaimers. 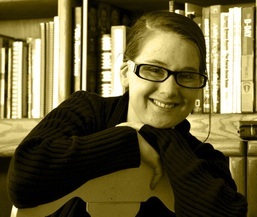 Amber Schamel, author of The Healer’s Touch, is our guest blogger. Amber was born in Littleton, CO and has traveled extensively throughout the United States, Europe, and the Holy Land. She was raised in a family of 11 children, homeschooled through her education and currently works with their 10 family businesses as bookkeeper and marketing director. She volunteers half of the summer helping and ministering to young girls and Christian families. Amber loves history, culture, reading and music. She has a musical ministry and travels throughout the United States ministering through song. During her spare time she enjoys crafting Christ-honoring stories that will inspire and encourage her readers. Amber currently lives with her family outside of Colorado Springs, CO. Welcome, Amber. Please tell us a little about yourself. I was homeschooled all throughout my education and now I work with my family as bookkeeper and marketing director. I have a volunteer ministry and write books in my spare time. What 5 fun or unique things can you tell us about yourself that we don’t know? Haha. Wow. Well, I am from a family of (going on) 12 children. My mother is expecting in late December or January. Tickling little siblings is one of my favorite pass times. I love to sing! A lot of people begged me to make a CD, so we finally got one made and it has three original songs on it. I also have never cut my hair. It's about thigh length now. I enjoy music, hanging out with friends and family, attending church meetings, playing piano, riding horses (though I don't get to do that much anymore) taking walks in the rain, spending time alone with Jesus. I have always had an active imagination and even as a young girl I would make up stories and play them out in my make believe. I started writing those stories down when I was about fourteen. But the real calling came about the time I graduated from High School. I had been doing a lot of study on how media and books affect people's attitudes and worldview. It was astonishing how the subtle messages that have been worked into entertainment over the years has completely transformed our nation and our morals. I realized that someone needed to write stories that upheld morals, faith and godliness. The Lord then led me to Habakkuk 2:2 which says "And the Lord answered me, and said, Write the vision, and make it plain upon tables, that he may run that readeth it." That became my commission. Yes, I have a corner of my bedroom where my laptop is set up. I have my special writing mug that says "Writer's Block: When your imaginary friends won't speak to you." and pictures hanging on my wall that say "Home is where your story begins" and "Life is a story, what does yours say?" Yes, with very few exceptions. Usually the title is very closely linked to the story line. In fact, I've even had story ideas come from titles. 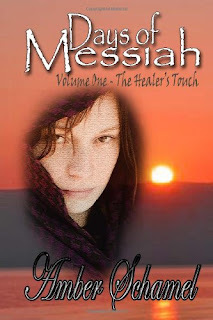 The Healer's Touch is the first book in the Days of Messiah Series. It's about Aaliyah, a Hebrew woman . Aaliyah's last chance at winning her husband's love is destroyed when she is banished from her home as an 'unclean' sinner. Struggling to survive amidst the fear, grief and bitterness of living in a leper colony, she would give anything just to see her son again. When rumors of a Healer from Nazareth reach the colony, Aaliyah wonders if this man could really heal her, or if He would despise her like the rest of her people. It is now that Aaliyah must make the most difficult decision of her life: risk her life to appear in public, or die a leper. I want them to come to the same realization that Aaliyah does, and that I did several years ago: bitterness is a terrible disease. It consumes you, eats you up, and will kill you if it isn't cured. And there is only one person who can cure it, and that's Jesus Christ. In 2007 I wrote The Healer's Touch as a short story. That was during the time when I was dealing with a lot of bitterness in my personal life. The similarities between leprosy and bitterness really struck me, and I was inspired to write about it. Here we are, six years later, and it has become a novella! Yes. The Healer's Touch is set in ancient Israel which took some research. And it is also about a woman with leprosy which also took some research. I really enjoy that part of writing, though. Especially when it comes to learning how people in other time periods lived. I have been writing since I was about 14 years old (2005). I finished my first story in 2007, and sold it as my debut book in April of 2013. The Healer's Touch is my second book. Just keep working. Rejections don't usually mean your work isn't good, just that you haven't found the right person yet. Secondly, start blogging and building your platform now. Because by the time you sell a book, you're going to need it. I am working on book 2 in the Days of Messiah Series which is the same story line that is in The Healer's Touch, but from Aaliyah's husband's point of view. Read lots of books about writing, subscribe to lots of blogs about marketing and writing, and build your platform now. And do a lot of praying. Our writing is nothing without the inspiration of the Holy Spirit. The Healer's Touch is currently available on Amazon, Barnes & Noble, Kobo as an ebook, and it's also available on Amazon as a paperback. Jo, thank you so much for having me on your blog today! It has been so much fun! Many blessings to you! Amber, thanks for the interesting visit with me and my readers. Thank you for offering a copy of your book, which one commenter will win in a drawing. Remember: leave a comment on THIS post by 6 p.m. CT Wednesday, August 14, 2013 and you'll be entered in the drawing for a copy of The Healer's Touch by Amber Schamel. You must be eighteen, have a U.S. mailing address, void where prohibited. Please, please remember to leave your email address or I cannot enter you in the drawing. I’ll need you email address so that should you be the winner I can get in touch with you for your mailing address. I’ll announce the winner in Thursday’s blog. The winner of last Thursday's blog post for a copy of The Newspaper Code by Lisa Lickel is Bonnie. I'll email you to get your mailing address and we’ll get the book out to you. Thanks all for commenting. Watch for more book giveaways. Thanks so much for having me on your blog today Jo! What a fun interview this has been! Does anyone have any questions for me? Amber, glad to have you visit me and my readers. We lived many years in Denver, Co, so I know Littleton well. I am in awe of what Amber has accomplished at her young age. She sounds very focused on her goals and has great advice for those of us much older, but not necessarily wiser! Denver is a beautiful city. The mountains got their first dusting of snow on Saturday! Thanks for stopping by! It's nice to meet you. Joanne, thanks for coming by and leaving your comment. Thank you Sharron! The same to you! Sharron, glad you stopped by and left your comment. Treva, glad you enjoyed the interview with Amber. Thanks for reading and leaving your comment. Enjoyed your interview & agree with the previous comments - you have certainly accomplished much by a very young age. I appreciate the fact that you have such a love for Christ, & for others. I love biblical stories & would love to read/win your book. Thanks! I love biblical fiction too. What's the best one you've read so far? Bonnie, glad you enjoyed the interview with Amber. Thanks for leaving your comment. I really appreciate you following my blog! Amber - my favorite biblical fiction are the books by Liz Curtis Higgs. I love her descriptions & attention to detail - makes me feel as if I am there with the characters. Welcome Amber. !2 children. I can't imagine being pregnant that many times, tho I was one off 8. $ was enough for me. Your book sounds interesting and I would love to win it. Thanks for stopping by Maxie! You're absolutely right, my mom is Superwoman! :) There's never a dull moment. Maxie, you're welcome. Glad you found a new author. Glad you stopped by and left your comment. I appreciate you following my blog! I really enjoyed your interview, Amber. I've been riding horses, snow sledding, and riding motorcycles in a skirt. Your book sounds great and very interesting. Please enter me in the giveaway. It's nice to meet you! Thanks for stopping by. There were more questions than comments. Except the first year we were visiting cousins in CA, we went to the mountains. One cousin was videoing as I sled down the hill. His remark on the video, "There she goes and in a skirt". Barbara, glad you enjoyed the interview with Amber. You're entered in the giveaway! Wonderful interview with fun & interesting questions! I've read both of Amber's books & can't wait for the next one! I love the message of The Healer's Touch & how it is conveyed. The world needs more books like this one! Thank you! I'm working on the sequel. If you come to my Facebook party on Thursday night, I'll be giving a little sneak peak into the next book in the series as well as my upcoming Christmas tale. Donna, glad you found a new author. Thanks for cominng by and leaving your comment. I would love to win, read and review this. My sister had 10 kids and 2 stepchildren - so know what a large family is - noisy. I was a bookkeeper all my life when I worked outside home. Even worked from home doing it for awhile here.